By Alan Green in VectorVest on 11th July 2017 . Taptica International (TAP.L) offers data-focused marketing solutions that drive execution and brand insight in mobile, leveraging video, native, and display to reach the users for every application, service, and brand. The technology is based on artificial intelligence and machine learning at big data scale. The company works with more than 450 advertisers, including Amazon, Disney, Facebook, Twitter, OpenTable, Expedia, and Zynga, and more than 50,000 supply and publishing partners worldwide. VectorVest highlighted the potential of TAP in a blog entry on the 21st March 2017. At that stage the share was trading at 295 and has made considerable progress since the entry. The share price at the close on the 10th of July was 371. The share remains undervalued and has an excellent earnings potential RV) on the VectorVest program. The RV on a scale between 0 and 2 is 1.57. This is judged as excellent. Also the relative safety (RS) is good at 1.11, also on a scale between o and 2. The share pays a dividend yield of over 2% and VectorVest forecasts that this will grow strongly over the next year. 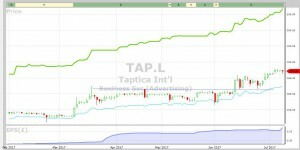 The chart of TAP is shown below where the technical picture is strong. The share has been on a Buy recommendation on VectorVest since the March 2017. During June 2017 the share broke upwards as forecast in March and since has tested the previous resistance twice. Since this double bottom the share has been trending upwards and looks poised for further significant gains. As reported last weekend the general UK market has printed a Confirmed Down since the close on July 4th 2017. The advice on the front page of VectorVest suggests caution and that’s great advice for the moment. 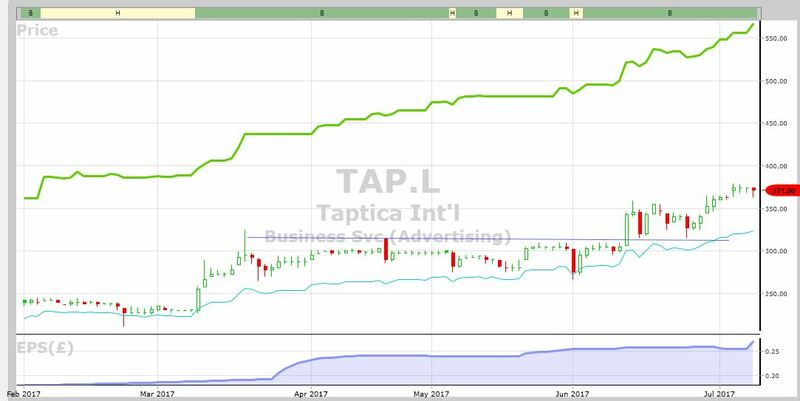 If and when the general market gets back into buying mode TAP looks highly probable for further gains. Although this share is suitable for my speculative purposes it may not be suitable for you. Readers can examine trading opportunities on TAP and a host of other similar stocks for a single payment of £5.95. This gives access to the VectorVest Risk Free 5-week trial, where members enjoy unlimited access to VectorVest UK & U.S., plus VectorVest University for on-demand strategies and training. Link here to view.